the finest in wilderness relaxation. Stay in May & Get 25% Off Your Reservation! We will be CLOSED for Spring Cleaning April 8th-24th and we will re-open April 25th. We apologize for any inconvenience and look forward to seeing you again soon! Enjoy family fun and Northwoods adventure every season of the year! Pitlik’s Sand Beach Resort features picturesque wilderness relaxation, peaceful lodging and activities for a terrific Eagle River getaway. Your stay at Pitlik’s can include rounds of golf, biking on paved trails, horseback riding and thrilling go-kart rides. Winter brings you miles of trails, perfect for NE Wisconsin cross-country skiing and snowmobiling. 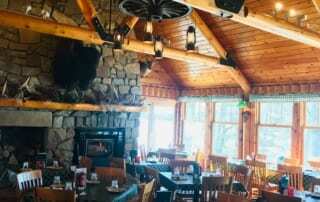 You’ll love the resort’s northwoods location offering the finest in wilderness relaxing! A variety of cabins are great for couples or large groups. Here is the tranquility of nature, the comfort of home and pure fun, on the beach, sitting around a crackling campfire or mingling with friends and family in the rustic main lodge restaurant and taproom, all year round! Pitlik’s Resort is located on Sand Lake, nine miles southwest of Eagle River, Wisconsin. Sand Lake is one of five lakes connected on the Sugar Camp Chain of Lakes. The twelve cabins and rustic main lodge stand on a grassy slope overlooking the lake’s south shore. Acres of heavy forest – Norway pine, birch, oak, and maple – envelope the resort providing a rich habitat for the area’s wildlife population.